Adjustable smart glasses capable of displaying text and bitmap images. We wanted to make a sort of wearable technology that can be customized according to the user. 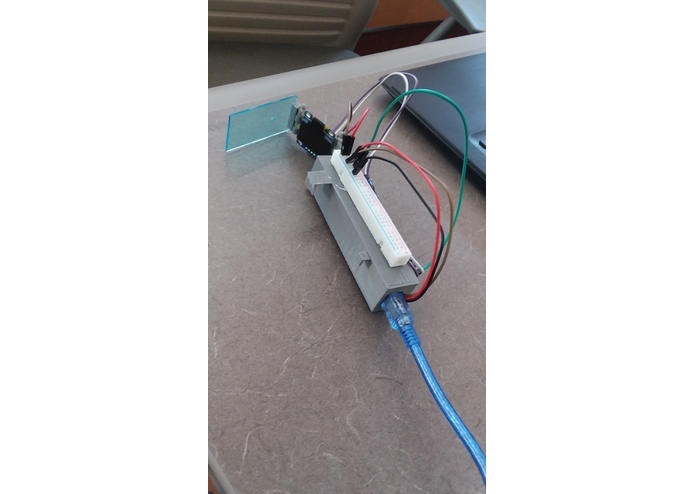 Using the Arduino Nano and an HC-08 BLE module, the device connects to a Bluetooth terminal via phone or laptop, where text can be sent from the device to the Bluetooth module. The Nano pulls the text from the serial terminal and prints it to the OLED display. The display then inverts the text and displays the message on a reflective screen. 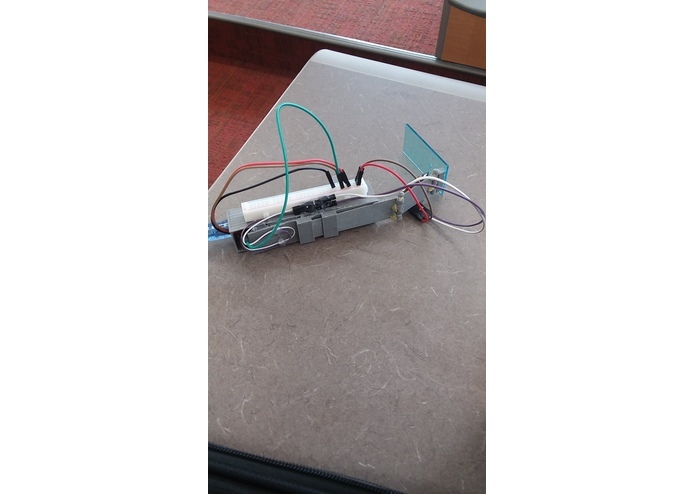 The entire project was programmed using the Arduino IDE. The OLED was programmed based on the Adafruit library, which was then altered to reverse the scan directing when printing text and pictures to the display. The Bluetooth device was tested using the SoftwareSerial library, which was then altered to print text to the OLED instead of the Serial Monitor. The frame was designed in Tinkercad and then 3D printed. The reflective screen was pulled from a Lego set. The module can be powered by either a power conversion module or from a portable phone charger. The OLED posed a challenge when attempting to reverse the display. There were no library functions to accomplish this, so the library had to be edited directly to reverse the print scan direction. In addition, the Bluetooth module refused to connect, so multiple AT commands were tested in changing the pin and device type from master to slave. In the end, the Bluetooth terminal connected, though direct phone connection is still spotty. 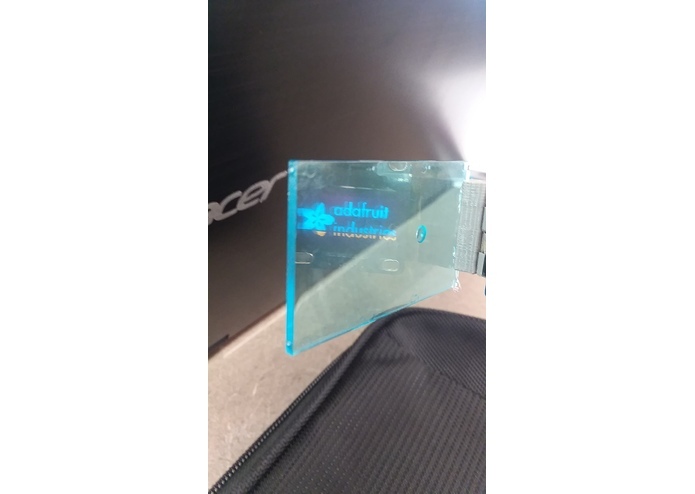 The text would only print on the serial monitor for some time, then the first letter was printed to the serial monitor and the rest was printed to the OLED screen, requiring s pseudo character to be typed in order for the pull message to be printed. We overcame this obstacle through countless code adjustments, which we are proud of. We are also proud of being able to connect the device successfully through Bluetooth. We learned how to code and troubleshoot an OLED display and HC-08 BLE module. We also learned how to make a 3D module to 3D print. The next steps include refining the case to be more compact, make a more portable battery source to power the device, make an app or program to constantly feed weather, time, Google calendar events and other information to the Glass when prompted, and finally, switch out the Arduino Nano and BLE module for a Rasperry Pi 0 and switch the OLED with a pico projector or high resolution OLED to create a wearable Linux operating system that can be navigated with a capacitive sensor.